The sculpture of a diver which is located on the Whyalla Foreshore was created by Yvonne Dorward; it is free standing measuring 2.2 x 2 metres. Whyalla is a city with a diverse culture. Performances, shows, events and exhibitions showcase a vibrant city reflected in the arts. Whyalla is recognised as a regional hub for creative expression. Seasonal productions, variety tours, performing local musicians and recent film releases ensure there is usually something happening within the arts community of Whyalla to entertain and delight. Public art is dispersed throughout Whyalla in gardens, along trails and in public spaces. Disabled access is available to the theatre, auditorium, toilets and parking. Visitors are invited to call into the theatre and browse through the foyer. On permanent view are five lead-light windows depicting aspects of Whyalla and a mural tracing the pioneer history of the Middleback Ranges. Location: 97 McDouall Stuart Ave, Whyalla Stuart (garden of Whyalla Veterinary Clinic).….. 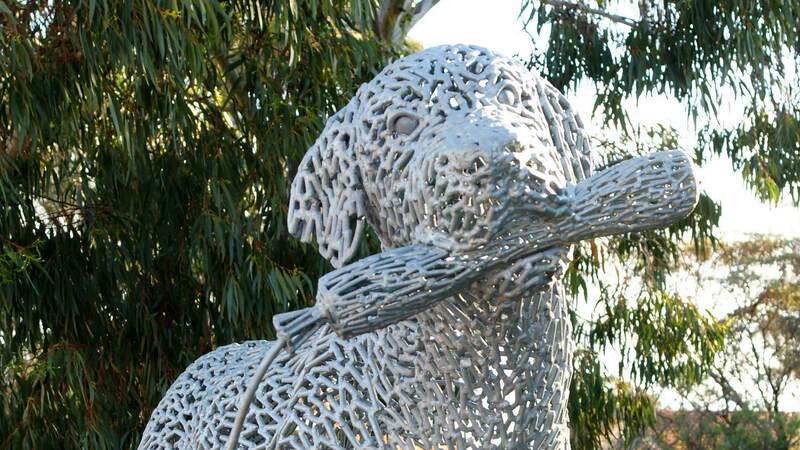 The sculpture is based on the dog from Henry Lawson’s famous Australian bush tale ‘The Loaded Dog’. The story is about a playful mischievous retriever, Tommy, who makes off with a stick of explosive. Tommy drags the fuse through the campfire, lighting it and creating mayhem in the chase that follows. Whyalla is famous for its rich fishing grounds and a world phenomenon of cuttlefish breeding. The public art acknowledges the natural environment and human interaction and was commissioned to enhance the city’s foreshore. It is a story of mutual interaction and celebration of the sea. The official opening coincided with the opening of the 2012 Fishy Fringe Festival in Whyalla. 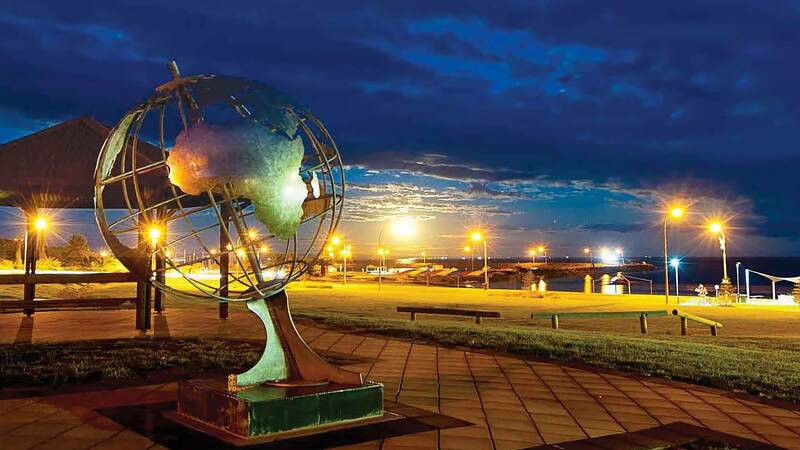 The Rotary Club of Whyalla has erected a 2.5m stainless steel globe of the world and a sundial at the Whyalla Foreshore. The steel globe honours the multi-cultural heritage of Whyalla, recognising the countries of origin of the city’s immigrant workforce. The steel used in the manufacture of the globe was mined and smelted at OneSteel Manufacturing Plant in Whyalla. This striking and memorable artwork was unveiled on World Harmony Day, 22 March 2014.